The component frequencies of each burst are delayed by different amounts of time depending on the wavelength. This delay is described by a value referred to as a dispersion measure (DM). This results in a received signal that sweeps rapidly down in frequency, as longer wavelengths are delayed more. The time between the arrival of the pulse at two different frequencies can be used to generate a kind of measure of distance, based on a dispersion constant. The measure does not have units of length, but of integrated electron density over the path from source to observer. Using some fancy Fourier tricks one could first undo the $1/\nu^2$ delay and then try to reconstruct what the original pulse might have looked like before dispersion. Has this been done? If so, how fast (narrow in time) might the original disturbance be? A millisecond? Less? The publication describing the original detection of the first known FRB (Lorimer, D. R., Bailes, M., McLaughlin, M. A., Narkevic, D. J. & Crawford, F.: A Bright Millisecond Radio Burst of Extragalactic Origin. arXiv:0709.4301) has a plot of the measurement that makes the effects of dispersion on this particular FRB nicely visible. Take a look at Fig. 2 in the paper. The actual signal is less than 10 ms, while dispersion delays the signal by around 200 ms over the 200 MHz frequency range between 1.3 and 1.5 GHz (note that this relationship is nonlinear). Your idea about algorithmically removing the effects of dispersion on the signal is regularly done in practice, search for "dedispersion". At our (hobbyist) observatory, we are using D. Lorimer's own sigproc package to do this, and it seems to be in widespread use amongst professional observers as well. The basic idea is to simulate a classical filterbank arrangement and shift each filter channel according to the DM. Figure 2: Frequency evolution and integrated pulse shape of the radio burst. The survey data, collected on 2001 August 24, are shown here as a two-dimensional ‘waterfall plot’ of intensity as a function of radio frequency versus time. The dispersion is clearly seen as a quadratic sweep across the frequency band, with broadening towards lower frequencies. From a measurement of the pulse delay across the receiver band using standard pulsar timing techniques, we determine the DM to be 375±1 cm−3 pc. The two white lines separated by 15 ms that bound the pulse show the expected behavior for the cold-plasma dispersion law assuming a DM of 375 cm−3 pc. The horizontal line at ∼ 1.34 GHz is an artifact in the data caused by a malfunctioning frequency channel. This plot is for one of the offset beams in which the digitizers were not saturated. By splitting the data into four frequency sub-bands we have measured both the half-power pulse width and flux density spectrum over the observing bandwidth. Accounting for pulse broadening due to known instrumental effects, we determine a frequency scaling relationship for the observed width W = 4.6 ms (f/1.4 GHz)−4.8±0.4 , where f is the observing frequency. A power-law fit to the mean flux densities obtained in each sub-band yields a spectral index of −4 ± 1. Inset: the total-power signal after a dispersive delay correction assuming a DM of 375 cm−3 pc and a reference frequency of 1.5165 GHz. The time axis on the inner figure also spans the range 0–500 ms.
Not the answer you're looking for? Browse other questions tagged radio-astronomy fast-radio-bursts or ask your own question. Why is this video showing radio waves transmitted from a radio telescope? What are the Similarities and Differences between ALMA and FAST? How could a neutron star cause repeated 'fast radio bursts' detected coming from outside of the galaxy? 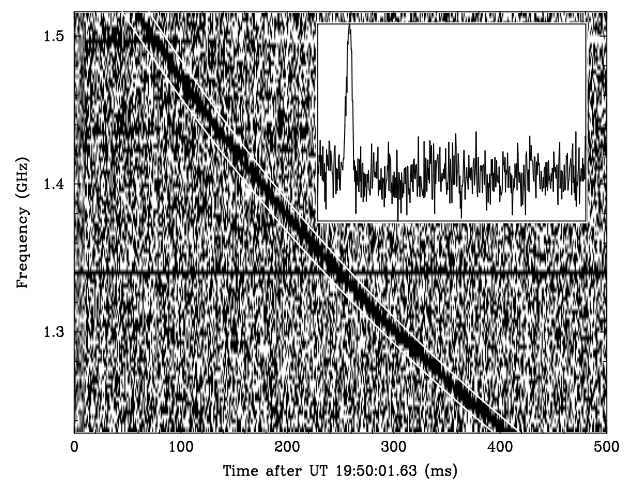 Is “Giga-hertz Astrophysical Transient Emission” distinct in any way from “Fast Radio Burst”? How do ASKAP's focal plane phased array feeds interact with the entire array phasing? How big a dish do I need for radio astronomy?